Louis Agassiz Fuertes was the most widely acclaimed American ornithological artist of his time. Born in Ithaca, New York, Fuertes began drawing birds at an early age, inspired by Audubon’s Birds of America. By the time he was seventeen, his illustrations had qualified him as an associate member of the American Ornithologists’ Union. Fuertes quickly became associated with leading ornithological scientists and artists, and he received professional commissions while still an undergraduate at Cornell. Fuertes went on to produce a vast body of work for an extremely broad range of projects. His paintings and drawings invariably convey the artist’s extremely careful study of his subjects’ form and behavior, and his diligence, precision and skill in draftsmanship produced some of the most animated and engaging bird illustrations of the twentieth century. Fuertes was determined to study and draw birds as they behaved in their natural habitats, unlike his predecessors, including Audubon, who took the easier route of drawing from stuffed specimens. As a result of this scrupulous and sensitive study of living birds, his works are characterized by a much greater accuracy and sense of vitality. Perhaps more than any of the other great bird artists, Fuertes’ birds are always full of life. In the book “A Celebration of Birds: The Life and Art of Louis Agassiz Fuertes,” the noted specialist on ornithological art Roger Tory Peterson notes that even today “most bird painters are still influenced directly or indirectly by Fuertes...” Fuertes traveled widely to broaden his knowledge of birds and their habitats. In 1899, for example, he accompanied the Harriman Expedition to Alaska, a group that traveled up the coast as far as Plover Bay in Siberia. Sponsored by the railroad an mining magnate Edward Harriman, the elaborately outfitted expedition included well-known scientists such as John Burroughs and John Muir, landscape artists Frederick Dellenbaugh and Robert Swain Gifford, and photographer Edward Curtis. By that time, Fuertes was widely acclaimed himself, his illustrations having been disseminated in a number of publications. Yet his original watercolors, the most compelling testaments to the unparalleled abilities of this great bird artist, are quite rare. At Arader Galleries we have in our collection the charming and detailed drawing of the Falcon in Flight. It was given as a Christmas gift to Henry “Harry” L. Ferguson in December 1923 by the artist, who was Mr. Ferguson’s friend and hunting partner. After H.L. Ferguson’s death in 1959, the work was inherited by his son, Charlie. After Charlie’s death this past January, Arader galleries acquired this fine work by Fuertes. Henry L. Ferguson, a son of one of island’s owners, served as the president of the Fishers Island Farms for more than 40 years, and was involved in many aspects of the Island’s development. His true passions, however, had little to do with business. He was an avid amateur ornithologist who loved to collect and study Fishers Island bird life, and a self-taught archaeologist who spent countless hours scouring the Island for Native American artifacts. 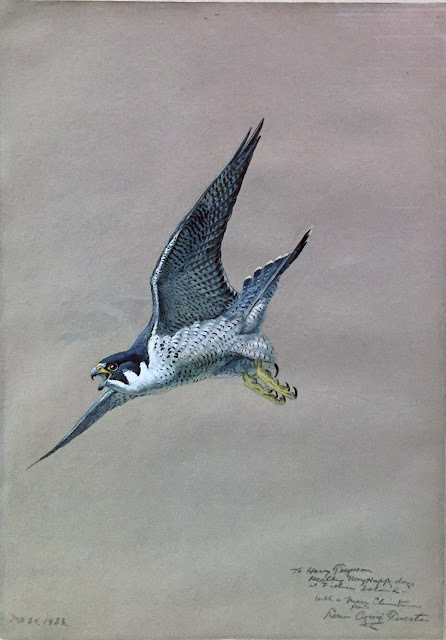 LOUIS AGASSIZ FUERTES (AMERICAN, 1874-1927), Falcon in Flight, watercolor and gouache on paper, signed ‘Louis Agassiz Fuertes’ l.l. Inscribed ‘To Harry Ferguson Recalling Many Happy Days at Fisher Island With a Merry Christmas from Louis Agassiz Fuertes’ Dated ‘Dec 25 1923’ l.l., 1923.